Steve Singer participated in The Four Seasons show in Spring/Summer 2017 at Village West. Born in New York City in 1950, Mr. Singer grew up in NJ; graduated Millburn High School in 1968; attended Dartmouth College where he majored in fine art and graduated in 1973. After receiving a scholarship to study sculpture at Sir John Cass School of Art, City of London Polytechnic, he relocated to London where he first developed his studies in box-cardboard, and then translated these ideas into the more permanent medium of forged-and-welded steel. These were first shown at Nicola Jacobs Gallery, London in 1982. In 1983 a grant from the Sir John and Lady Sainsbury Foundation enabled him to ship his work to and eventually show it in New York City. In 1984 he resettled in New York City, and established ateliers in Brooklyn from '85 until 2001, when he returned to London to mentor his daughter through her foundation year at Camberwell School of Art. In 2002 he returned to the US and re-established his atelier in Jersey City, NJ. He resides in Jersey City Heights with his wife, Andrea Raphael. 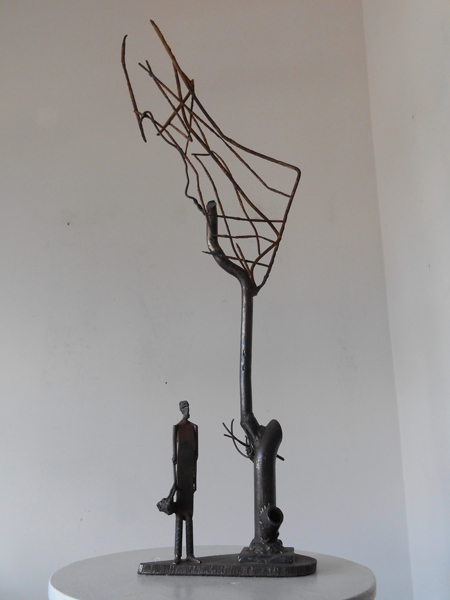 There he continues his commitment to drawing and painting from life along with his ongoing sculpture in steel. More information on Singer and his work can be found at stevesingerart.com.